Source: Norwegian Center for Global Analysis, 2015. The distinction between legitimate business and illicit activity is fluid in Africa due to the significant size of informal and unregulated trade on the continent. The rapid pace of globalization has allowed organized criminal groups to link up with international networks, expanding markets, access to new technologies, and improved methods of communication. According to the Organization for Economic Development (OECD), transnational crime generated $1.6 trillion in profits in 2015. These activities included counterfeiting, illegal logging, mining, and fishing, crude oil theft, and trafficking in organs, weapons, humans, cultural property, and natural resources. Between 2013 and 2016, 100,000 elephants were killed for their ivory, and rhino poaching grew 1,000 percent—staggering figures given the strategic importance of tourism for African states’ foreign currency reserves and tax base. In many African countries, organized crime has both taken advantage of and exacerbated government corruption, ranging from petty crimes by police officers to large-scale complicity by high-level officials. Underdevelopment also makes Africa’s economies highly vulnerable to illicit trade, which may be the only source of income for individuals and communities. Transnational crime has fueled the rise of violent extremist groups in places like Nigeria, the Horn of Africa, and the Sahel-Sahara region. According to David Luna, who specializes in international narcotics and law enforcement at the U.S. State Department, tapping into transnational organized criminal networks can be profitable for terrorist infrastructures and networks. 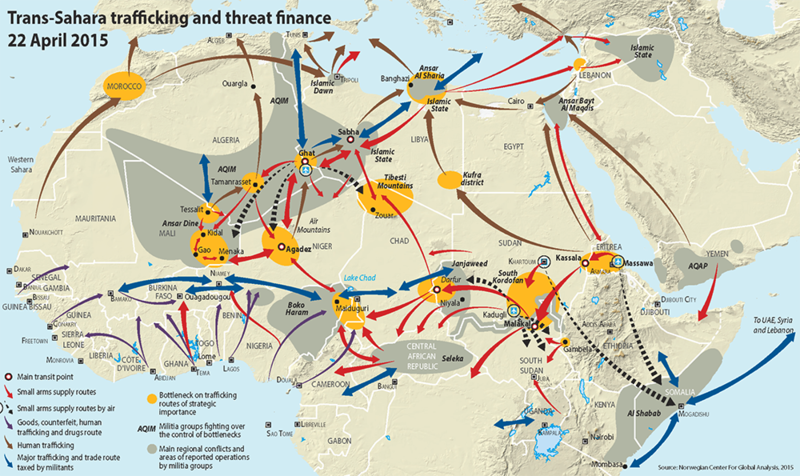 “Al Qaeda in the Islamic Maghreb engages in illegal taxation in its areas of control, ISIS in Libya is active in human and narcotics trafficking, and Boko Haram generates significant revenues from trade in cocaine and heroin,” says Luna. At the same time, mechanisms for deterrence are weak. According to OECD, the conviction rate for rhino poaching in 2016 was less than 5 percent. The UN Office on Drugs and Crime found that “40 percent of countries recorded few or no convictions for human traffickers,” and over the past 10 years there has been no discernible increase in the global criminal justice response to this crime. It is, in essence, a high reward, low risk way to make a profit. Will Wechsler of the Center for American Progress notes that when transnational organized crime merges with other threats, national security and stability can be compromised. Crime syndicates working with terrorist networks deny the government its legitimate monopoly on the use of force and limit or eliminate its control over its sovereign territory. According to Wechsler, transnational criminal enterprises also indirectly compromise political systems, undermine economic development, hinder foreign direct investment, weaken the rule of law, and damage foreign relations. The convergence of criminal and terrorist networks strengthens their ability to evade national jurisdictions and adapt to new situations and countermeasures as they become more flexible and sophisticated. Al Shabaab, for instance, once engaged in a lucrative multimillion dollar trade in charcoal in Somalia. Through the control and taxation of port traffic, charcoal, timber, and sugar exports, foreign exchange bureaus, and diaspora remittances, this enterprise generated an estimated $70–100 million a year. 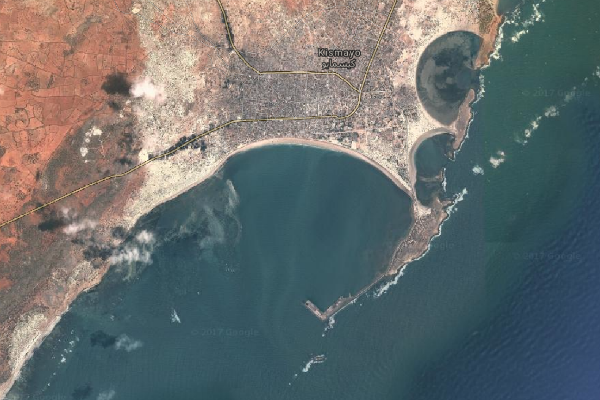 After AMISOM forces expelled it from its two principal revenue collection points—the strategic port of Kismayo and Bakara market in Mogadishu—Al Shabaab shifted its sights to rural areas, taxing goods on their way to the coastal ports and earning millions of dollars’ worth of revenue. Al Shabaab also continues to invest in a variety of other illicit business interests. Response mechanisms should be woven into national security strategies and employ all available domestic tools—law enforcement, the military, finance, information—while tapping into the mechanisms available through cross-border cooperation and international allies. These approaches should address not only the supply of and demand for illicit goods, but also the infrastructure, methods, means, and motives of transnational criminals and their collaborators. Military, intelligence, and law enforcement actions against violent extremist groups offer short-term wins. David Luna, “Trans-National Organized Crime in Africa,” presentation, Africa Center for Strategic Studies, May 12, 2017. William Wechsler, “Trans-National Organized Crime in Africa,” presentation, Africa Center for Strategic Studies, May 12, 2017. Davin O’Regan and Peter Thompson, “Advancing Stability and Reconciliation in Guinea-Bissau: Lessons from Africa’s First Narco-State,” Special Report No. 2, Africa Center for Strategic Studies, June 30, 2013. Tom Keatinge, “The Role of Finance in Defeating Al Shabaab,” Royal United Services Institute, December 30, 2014. Bradley Anderson and Johan Jooste, “Wildlife Poaching: Africa’s Surging Trafficking Threat,” Africa Security Brief No. 8, May 2014. Mark Shaw, Tuesday Reitano, and Marcena Hunter, “Comprehensive Assessment of Drug Trafficking and Organized Crime in West and Central Africa,” African Union, January 2014. Wolfram Lacher, “Organized Crime and Conflict in the Sahel-Sahara Region,” Carnegie Endowment of International Peace, September 2012.